#climatemarch voices are loud, but will politics drown them out? Over three thousand climate activists, indigenous groups, labor unions, faith groups and others gathered on Manhattan’s West Side Sunday morning for the People’s Climate March. 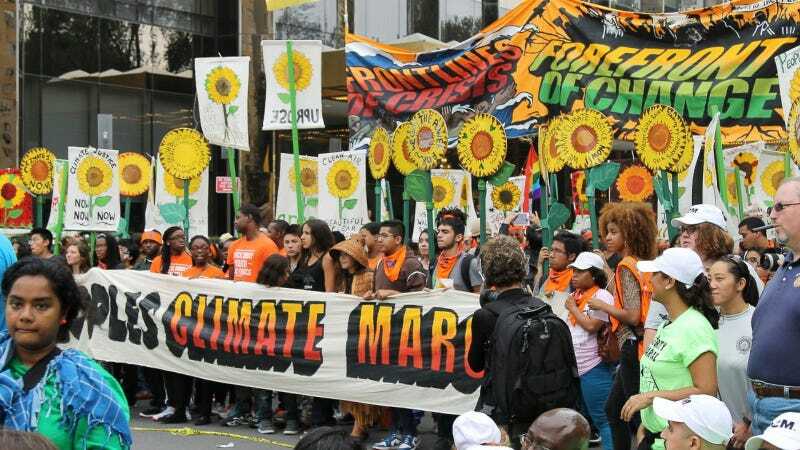 Held two days before the United Nations Climate Summit 2014, marchers and attendees called on world leaders to wake up to the havoc climate change is wreaking on the planet. “We the people have been trying to tell the powers that be to make change through the regular channels for too long,” said Linda Helland, a 44-year-old California resident who made the trek to the march as part of a trip for the twentieth reunion of her peace and global studies college reunion. “There will be political consequences” if lawmakers, namely those with White House aspirations, don’t adopt more concrete environmental policies in the upcoming years, she said, citing the need for a carbon tax. Market measures just aren’t cutting it anymore, Helland said. Groups traveled far and wide to be in New York Sunday morning. The Cleo Institute, a Florida-based environmental group, came to the march with concerns about rising sea levels and salt water intrusion. “It’s going to take a massive move,” to get politicians to take notice, Programs Manager Karina Castillo said, calling for lawmakers to enact some form of regulation on carbon. It could be a tax or some other measure. The group is planning a social media blitz around the upcoming UN summit in a bid to raise political awareness, director Caroline Lewis, 56, said. Sunday’s march was a precursor to the UN’s upcoming climate summit, in which UN Secretary-General Ban Ki-moon has invited world leaders to bring forward solutions to reduce emissions, strengthen climate resilience and come up with political solutions to save the environment, according to the UN. Castillo said she hopes Tuesday’s summit will help create a unified voice for the larger Conference of Parties summit, to be held in Paris in 2015. At least one group at the march, South Bronx Unite, will be continuing the fight past Sunday’s march. The group, a New York-based advocacy organization, was invited to attend Tuesday’s summit. More than 500 members of civil society applied to attend the conference but only 38 were chosen, member Ana Maria Cardenas said before Sunday’s march. “We’re hoping that this weekend we can bring attention to our struggle,” Cardenas said. The South Bronx, which has been dubbed asthma alley, is disproportionately affected by the respiratory disorder. Asthma rates in the area are 21 percent higher than in more affluent parts of New York City, due to emissions from all of the diesel trucks in the area, Cardenas said, citing a recent health study. Of the 38 delegates of civil society chosen to be at the UN summit, only three are from the United States. South Bronx Unite is the only New York City-based group that will be at the UN on Tuesday. “It’s important for us to be at the UN because we’re putting a face to the climate struggle,” which disproportionately affects poor communities, that also often happen to communities of color, Cardenas said. At the summit, the representatives from civil society will be involved in coalitions that are either launching or scaling up initiatives focused on the various aspects of climate change, including renewable energy and agriculture, Shepard said. There will also be discussions on the lives of people most vulnerable to climate change, climate science and the economic benefits behind climate change. “The problem of climate change can’t be solved by just governments alone,” United Nations spokesman Daniel Shepard said. Cardenas doesn’t have high hopes for the summit. However, the point of Tuesday’s summit isn’t to effect immediate, wide-sweeping policy changes, Shepard insists. In keeping with Cardenas’ low hopes for the UN summit, the meeting might be coming too late. “For the sixth year running, the global economy has missed the decarbonisation target needed to limit global warming to 2˚C,” according to a recent report from PricewaterhouseCoopers. Back in 2013, the global economy was tasked with decarbonising at 6 percent a year. However, so far, we’ve only managed 1.2 percent, according to the PwC report. And while that cut is the highest we’ve managed globally thus far, to have a meaningful impact, the global economy actually needs to cut its carbon intensity by 6.2 percent a year every year until 2100.